But what about students in the high-stress world of universities? 95%: of on campus counseling centers surveyed said students with psychological problems is a growing concern. 95% of people who commit suicide have a psychological disorder like depression at the time of their suicide. 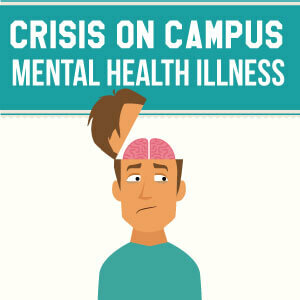 34.2% – of students with a mental health condition said college did not know about their crisis. 37% – Dropout rate among students with mental health conditions (age 14-21 and older) who are served by special education. 64% – of students with a mental health condition quit school for mental health related reasons.